Lately, Adam and I have been speaking about religion and how, growing up, it always felt like our religion was under attack. The whole concept of religion is this belief of being the other…the chosen ones. While there is an amount of merit to that isolation, religion as we know it is always changing so those who practice it fervently or even casually, may feel it’s under attack. It’s not unique to any particular religion, though it can be truer for some than others at particular times in certain places. It took a trip to Barnes and Noble to hammer that point home for me. We were visiting the Barnes and Nobles in Park Slope one Saturday afternoon and we took our little boy to the kids section. We were surrounded by tons of books for kids. I happened upon the religious section and wanted to get my son a Bible. I remembered how much I loved picture Bibles growing up and wanted to pass this joy on to him. We have always agreed to raise him Jewish but aware and proud of his Christian heritage and knowledgeable about other religions. I started looking for other religious books to get for him. We readily admit we are indoctrinating him into Judaism. I mean, indoctrination is the best way to perpetuate the religion, no? It seems only fair to make it a diverse religious indoctrination. I thought I could just find kid versions of the Q’uran, maybe a kids book about beginners Buddhism and meditation and a kids versions of the Torah. I also was thinking it would be fun to start to teach him a bit about Hinduism since my grandfather was a Hindu. Naively, I expected this from a prominent bookstore in Park Slope. Instead, we found 4-5 shelves of Christian Bibles and other kids’ books about Christianity, one Curious George book on Ramadan and about 2 other books that weren’t Christian. To put it in context, there were over 50 books about Christianity and less than 5 about other religions on the bottom shelf. I am a Christian but I found this really not cool. Let’s not even delve into the fact that Curious George is the only kids book about Ramadan. 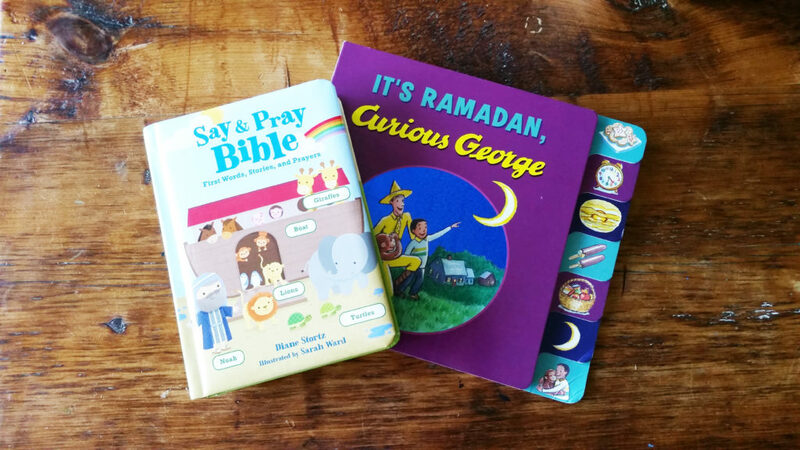 We took a Bible and the Curious George Ramadan book and went to check out. I mentioned my concern to the cashier. Her explanation? The store is only responding to what is being bought in the neighborhood. I find it hard to believe that the ratio of Christians to ALL other religions in Park Slope is reflected in a 50:5 ratio. Our synagogue is in Park Slope and there are tons of kids there. There are entire districts of Muslim and Jewish people to name the obvious ones. I also find it hard to believe that we are in the drastic minority in Brooklyn with our choice to raise our son knowledgeable about many religions. I grew up as a Seventh Day Adventist Christian. A huge part of our religion was a belief that we were not OF the world. We were taught that we were the minority. Fast forward to living with Adam. Adam grew up thinking the same about Jews. He grew up with the belief that Christianity is the dominant religion in the U.S. and often felt like it was forced on him in school. I doubted this because I am always surrounded by Jewish people no matter where I go in New York. As it turns out, Christianity may be doing a number on the fiber of America. This experience led to a very uncomfortable discussion on the way home about the fact that yes, Christianity seems to dominate American culture, even in diverse Brooklyn. I felt betrayed by my religion. Are we systematically forcing ourselves down America’s throat? Is this idea of Christians being the outcasts a myth? And would another religion do the same if given the opportunity? I think about countries where one religion is dominantly practiced and I find it scary. Places like Israel encourage intolerance and dogma. Is that where America is headed? Actually, don’t answer that. Adam and I plan to raise our son with the power of knowledge. He is Jewish but we want him to make a choice when he is old enough about which religion he wants to be a part of, if any at all. Even if we have to order books online to teach him about other religions, we will. Religious intolerance and disparities aren’t always as obvious as the orange-haired monster. Sometimes, it is as simple as a 50:5 book ratio during a fun Saturday afternoon trip to the bookstore. < Previous Happy Birthday, America! Next > When will it end?